Anti-surge controllers are found on centrifugal compressors. The basic function of anti-surge control is to maintain a minimum flow during extreme conditions. Using measurements from suction and discharge pressure, discharge pressure and temperature, and either suction or discharge flow, the anti-surge controller determines the flow at which the condition of surge will occur. To compensate for measurement inaccuracies, the logic solver adds a control safety margin (typically 10 percent) surge flow, which is then used as the anti-surge controller setpoint. This setpoint is the minimum flow that will be allowed through the compressor. In order to maintain the flow at or above the anti-surge controller setpoint, the logic solver uses a Proportional-Integral (PI) control loop to generate an output signal, which is directed to a recycle control valve. 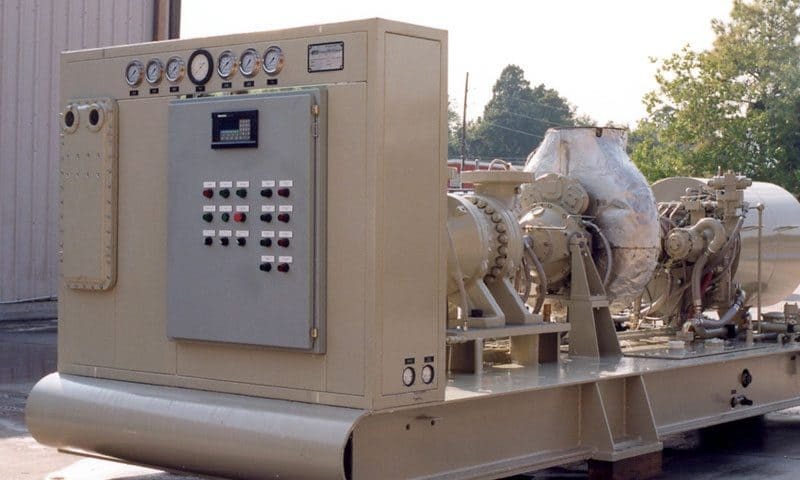 The recycle control valve is connected to both the suction and discharge flow lines on the centrifugal compressor. During low flow conditions, anti-surge control output signal actuates (opens) the recycle control valve to divert discharge flow back to the suction in order to maintain the minimum flow setpoint. What differentiates an anti-surge controller from a general process flow controller is that the minimum flow setpoint is dynamic and continuously changes as the process gas conditions (pressure and temperature) and process gas properties (molecular weight) change during operation. Modern-day anti-surge control logic solvers utilize process gas condition and process gas property invariant techniques to dynamically determine the minimum flow setpoint. Advanced compressor control solutions from Petrotech are flexible, cost-effective, and offer protection capabilities for your system. For an overview of our control systems and how we can update your equipment, visit our literature library to download our white papers on our control systems.